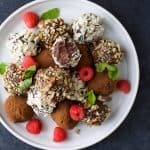 Easy Paleo Raspberry Chocolate Truffles using only 4 ingredients. Rich, decadent and everything you want in a chocolate truffle. The perfect healthy dessert for the holidays! Add fresh raspberries to a small food processor. Blend the raspberries until they look like a puree. Add raspberry mixture to the melted chocolate. Stir everything together. Cover the bowl and place in refrigerator for 2-3 hours. Optional: roll in the toppings of your choice, I used chopped hazelnuts, unsweetened coconut flakes and cocoa powder.